Dryers often send out warnings of malfunctioning. And when they do, it’s best to call our Mega Appliance Repair Canoga Park pros to take care of issues. Which are the most common indications of dryer problems? Don’t ignore such signs. These are often indications that lint is clogging the dryer’s tubes. But there might also be other problems with the appliance. 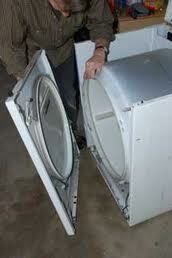 In any case, we offer same day dryer repair in Canoga Park, California. You can count on our techs to help you promptly and efficiently fix your appliance. We have huge experience in dryer service. With expertise in all dryer types and even the latest models by the largest brands in the marketplace, our pros can do a great job no matter what you need. Sometimes, serious problems like lint over-accumulation in the tubes are fixed by simply removing the lint. But such actions will save you from a fire. What our techs do before any dryer repair is troubleshoot the appliance to isolate its problems. Although we often have a very clear picture of what the problem might be, we always examine the parts of the appliance thoroughly to diagnose the issues accurately. Our inspections are as thorough during maintenance too. We recommend the regular service of your dryer for the avoidance of emergency problems and risks taken by using a clogged appliance. Whether you want repairs or maintenance, you can trust that our pros have the skills to service your independent dryer but also to provide comb washer and dryer repair in Canoga Park. Let us keep you safe by offering dryer installation should you decide to get a new appliance. Fitting correctly the dryer in terms of its position and connection for proper air flow and thus performance is essential. Our pros have the experience and skills to cover all Canoga Park dryer repair service needs. Call to ask our help today.